US GOVERNMENT ACCOUNTING IS SAD! Elephants are invading. If you don't believe it, ask CVS, Walgreen's, Starbucks, E-Trade, Ameritrade, T-Rowe or Red Hat. Wal-Mart, McDonald's, Bank America and Oracle have all decided to push around or to sit on their competition. The "little guys" must feel like there is are bull elephants running loose. The dung being dropped at CVS, and Walgreen's is deeply discounted generic drugs offered by Wal-Mart. In recent years, Walgreen's and CVS, have bought almost every prime corner location in America; in preparation for the day when the baby boomers turn 60; that day is here. VJ Day was August 15, 1945, add 60 years, 9 months, travel and fooling around time and you get yesterday. Just when CVS, and Walgreen were sitting pretty, big bad Wal-Mart. has write me for more commentary or to discuss your personal market interests. I write a combined response to several recent conversations about 401-K accounts, mutual funds and investment sectors. 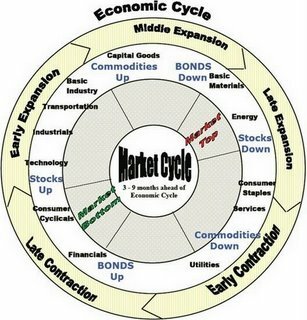 When the price of oil started to fall, I pushed hard on the idea that the oil money would flow to technology and to consumer cyclical stocks. 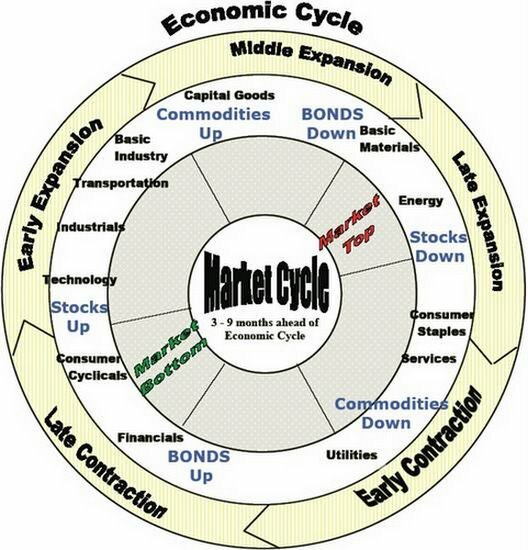 At other times, I wrote that the "second half" of the business cycle will ultimately be won by email for the rest of my commentary Or if you'd like to discuss your personal investment strategies. Enjoy This Strong Economy! Profits are Super! Having an economic clock handy is worthwhile. I am posting another one here for your use and mine. In the old days, AT&T and IBM were among the big solid companies that did well during the second half of the business cycle; what has changed? T still operates the big heavy duty truck lines to businesses. The percentage of voice traffic has fallen and the percentage of hoggish video traffic is climbing fast. SBC purchased AT&T and renamed itself AT&T Then it purchased BLS. Verizon purchased MCI. If you only looked at results a Rip Van Winkle of the 1970's would think that Verizon was spun off from AT&T to form the two dominate phone/data companies in America. Each has a growing cell phone business and there are many cell phone competitors but T and VZ carry the heavy duty business communications. Google is new competitor that has focused on connections to and from information servers. Let me put it this way, those who purchased business phone services around the mid cycle corrections of the 1970's, 1980's and 1990's enjoyed a nice ride for at least 4 years. Those who stayed too long, got slammed around in 2000 but it was a fun ride during the cycle. Comcast, TWX and other cable TV providers are having to adapt to the new environment. TWX took the big hit when it gave up its old model of charging extra for AOL Broadband. We have reached or are approaching the sweet spot for service providers. More and more video will be downloaded and more and more bandwidth will be required. TWX and Comcast have bets on content and on delivery. T and VZ are trying to add content but their focus is on very high capacity bandwidth. The picture phone is finally ready to explode onto the market. Face to face meetings will remain important but face to face over broadband connections is growing by leaps and bounds. In a relative few number of years, children will grow up understanding a phone call to be a face to face video conference.